I’ve realized that I tend to think about the simple and yet quality basics in my life and appreciate just that. And the rest of it? – Well the rest is really just all a bonus. Don’t get me wrong, I love nice things like expensive handbags, pretty jewelry, and lovely clothes. But if I needed to, I could live without these. So I come back to focusing on the basics – because without these, life would be completely different! When I was 16 years old, I took a missions trip to Romania with a team of people from my church’s youth group. During our few days of travel, our plans changed, and suddenly we found ourselves living, not visiting – but actually living with children who were looked down on as some of the lowest in their society. We were at an orphanage. From first glance you would have thought it was a mix of young boys and girls, but we quickly discovered they were all girls up to about age 16. We spent several mornings picking up the broken glass bottles from the yard that the drunks had tossed over the fence the night prior. We shared their meals of very little and unappealing simple food. We used a hole in the ground for a toilet, took our cold showers as quick as possible, and played outside with only the toys we had brought them. It was very hard to keep composure at all times, and to not have a decent hotel room to go back to at night and regroup was emotionally difficult. We were there completely living in it 100%. These children were at first very shy and insecure. But they had hearts of gold! They quickly took to us, and eventually offered us their only possession – a teddy bear that someone had donated over a year prior. We of course could not accept their sweet gesture, but it stuck with all of us. Here were children with absolutely nothing, and their greatest gift – this teddy bear (many still in their original wrappers) were being offered to us! How incredibly selfless these kids were, and how grateful they were that we came and cared. One day we decided to take the children into town to McDonald’s for a happy meal. The whole outing was quite an ordeal, but we eventually made it. These children had never been on a school bus before, never traveled into the city, and most definitely had never enjoyed McDonald’s. While sitting across from two of the girls that were very malnourished, I watched as they cautiously opened their happy meal bags. Frist they pulled out their french fries, which to them looked very foreign. But before either of them even took a bite, they offered me one. I politely declined and encouraged them to try it. They both ate their fries between giggles. Once finished, they rolled up their bags to save their burgers for later. Inside I was crying for them. The more nice things we tried to do for these children, the harder it became. I ended up using a translator to explain that the cheeseburgers would not last forever so they should go ahead and enjoy them now. My trip was filled with many more moments like this. To us it’s something that is so simple and yet often taken very much for granted. But to these girls, it was probably an experience they will always remember. Our hearts broke when we had to say good-bye at the end of our trip. Returning home was not easy. Coming back to the United States with such privilege left me feeling incredibly guilty. I lived my life very differently as I slowly transitioned back into my old life. I felt so guilty taking a hot shower for the first time, so I turned the water cold instead. I often got emotional when I sat on a toilet, and I started crying when I drove past McDonald’s. Eventually I transitioned back to my normal routine, but I still often think back to that entire experience. If you have ever lived without necessities, then you realize just how important they really are! The rest is just a bonus. When my children are old enough, I hope to take a family missions trip similar to the one I experienced. It’s one thing to tell my kids that a lot of children around the world do not get to experience what they do, but it’s a completely different experience to show them that first hand. I recently read an article that stated the “#1 thing that you can do to ensure you raise a good child, is to teach them to be grateful.” – WOW!! As I have taken some time to reflect on this statement, and my own life, I am finding that point very powerful! If we each believed that life is a gift and everything in it is truly a blessing, how different would our world be? I am a huge believer in teaching children manners, and at the root of that is a lot of gratefulness. 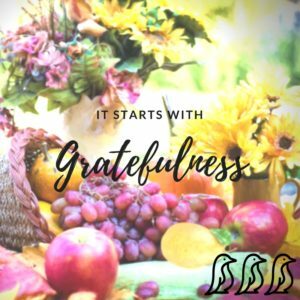 Using your pleases and thank you’s, respecting other people and their belongings, being humble and kind, it all ties into being thankful and grateful. This holiday season, I encourage you to look for ways to teach your children the meaning behind these powerful attributes. While I don’t expect you to jump on a plane and head to a struggling country, I encourage you to look for inspirations around you. Click here to read a list I compiled of simple things you can do to teach your children to pay their blessings forward, and/or to be grateful for what they already have.